Pie. It’s just something I never thought I’d miss when giving up wheat. I was never a big pie eater to begin with. But when someone says you can’t have something anymore, you want it. Am I right? I have tried making my own pie crust before and it’s turned out pretty well, although I’m not a fan of taking all that time to make one. I was thrilled when I happened upon Kinnikinnick’s frozen gluten-free pie crusts at Whole Foods, and they were on sale. But at a regular price of about $4.99 for two 8-inch crusts, that’s not bad for the GF market. I decided to make a Quiche first and give the crust a test. 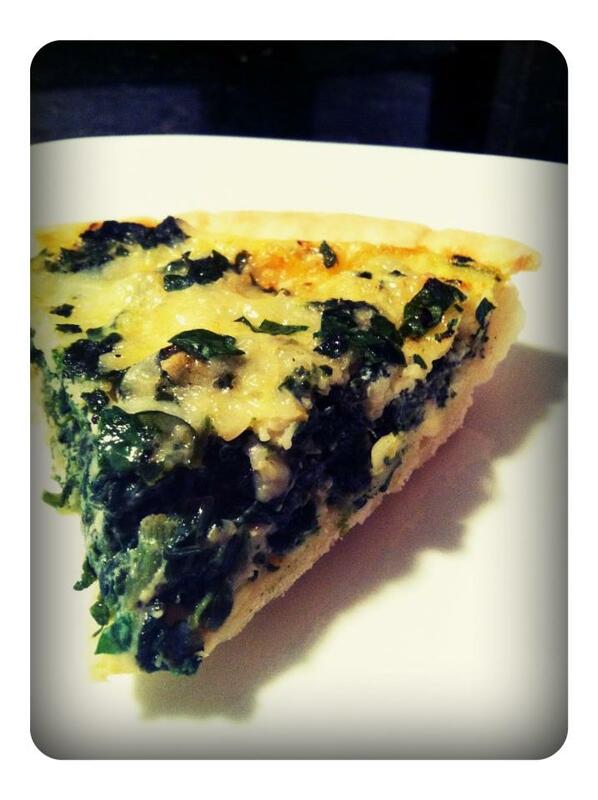 I made a simple spinach Quiche and it was a hit. The crust was flaky, tasty and not too strong. It really has a mild flavor for a crust, which to me is just what I want with a crust. A slight buttery flavor is good, as is a crust that doesn’t fall apart too quickly. It’s got to hold up to the filling, and it’s about the filling, right? The Quiche consisted of one sautéed onion, Havarti and Jarlsberg cheese, frozen and thawed spinach, 2 eggs and 4 egg whites. That’s it. Just a bit of salt/pepper/nutmeg/thyme and garlic. I baked the crust first for about 10 minutes, then layered onions, spinach, cheese and poured in the egg mixture. Bake for 35 minutes at 375 and viola! Finally a Quiche with a crust. And since that worked so well, I decided to try a pumpkin pie for Thanksgiving. I used the recipe on the can of pumpkin (pumpkin, condensed milk, egg, sugar) and it was, once again, wonderful. Just a note, the recipe on the can of Libby’s pumpkin will make enough for two of these pie shells. Luckily, there are two in each box. Perfect. Since you can never have enough pie, I also bought a fabulous cherry pie by Angel Cakes Bakery here in Phoenix. Angela makes the most wonderful pie crust of all, from scratch, and it’s gluten-free. Now, if I had my way that’s the only pie crust I would ever eat. But then I’d be calling her every week for more and I’d have to get a second job to pay for it. This was a treat and I highly recommend her cakes and pies. I’ve talked about her creativity and food before and I’ll continue to do so as long as she keeps baking. So, the dessert for the day was all set. What else do you need? Dinner, what dinner? What’s for dessert? White chocolate/chocolate chip cookies. Yum! Welcome to the new/old blog. I’ve decided to make the move to WordPress to have all the blogs in one place. I’m still working out the kinks, so if you find something, let me know. 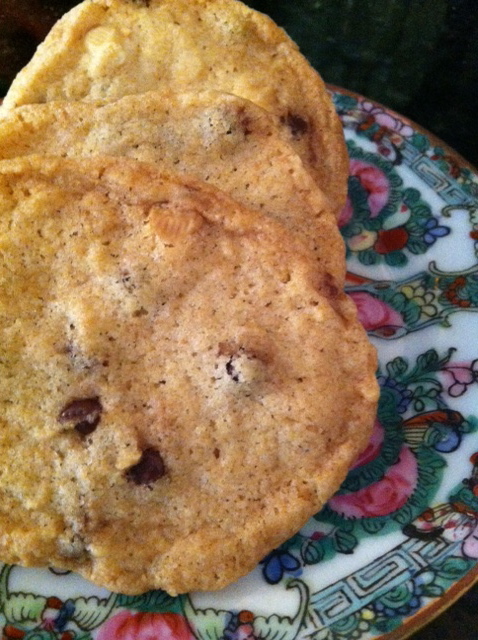 In honor of your visit, I made cookies. Have a seat, pour yourself some tea and look around. How do you like the new digs? Let me know, I’d love to hear your opinion and thanks for stopping by. 1. Mix flax meal with warm water and put in fridge. 2. Mix cake mix, brown sugar, OJ, vanilla in a large bowl. Since my brown sugar was a little hard, I mixed the juice and vanilla with the sugar and let it soften, then added it to the mix. If your sugar is soft, skip that part. 3. Mix in flax, which should be the consistency of egg whites now. Stir well, even though this is a thick mixture. 4. Mix in chips and using a little muscle, mix it all in. 5. 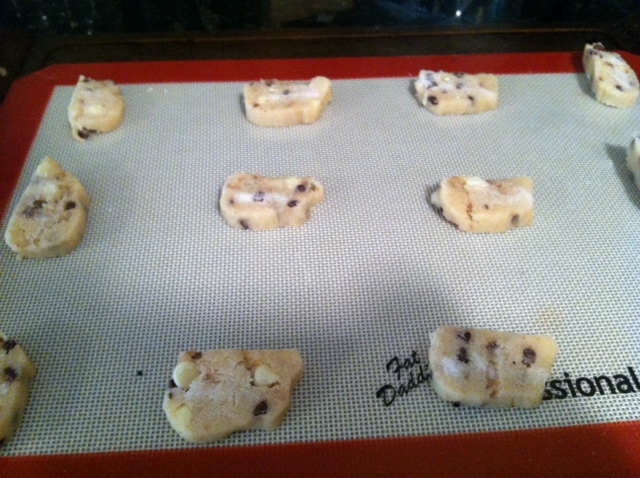 Pour out cookie mixture onto a sheet of wax paper. Fold over the paper and work the dough into a foot-long/ 2″ log. 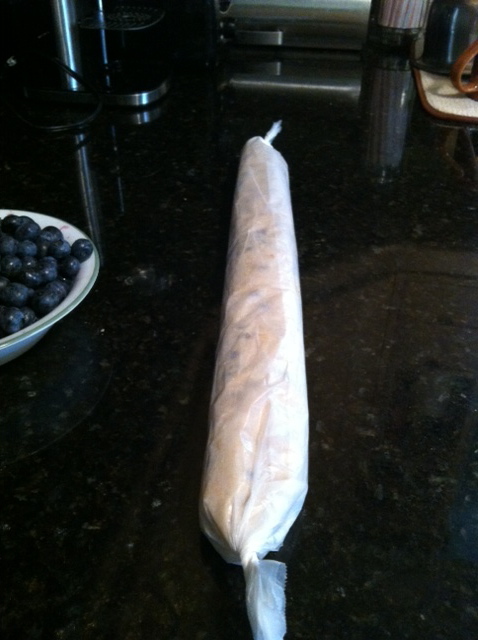 Wrap well and place in fridge for 3 hours to overnight to cool. Crispy and light. Perfect with that afternoon cup of tea. Best part, you only have to bake a few at a time. Put the rest in the freezer or leave in the fridge and make fresh, warm cookies right before the kids get home from school (or finish with their homework). I had a craving for caramel corn and decided to try and make my own. It always sounded so difficult and messy, but that never stopped me before. Besides, when a craving for something sweet hits me, not much can get in my way. After scouring cookbooks and the Internet, I decided to buy Trader Joe’s air-popped popcorn to begin with. I got rid of my air popper last year after realizing I never used it. Now, I wish I hadn’t. But, TJ’s seemed to do the trick. Then, I decided to use Paula Deen’s recipe for caramel corn, since it seemed to be the most simple. Click on the link for the entire recipe, but I’ve listed a few hints below to make it a little easier. 1. Once all the ingredients are in the pot and mixed, and the butter is melted, let it simmer/boil for 5 minutes without touching or stirring (resist the urge to stir, and I know that’s hard to do). Then add the baking soda. 2. I used 8 cups of popcorn (1.5 bags) but I think I would use 6-7 next time since not all of the popcorn got a good coating of the caramel. Although it’s not bad if some of it is lightly coated. That’s up to you. 3. Even though it bakes for an hour, don’t forget to stir it every 15 minutes so it cooks evenly. I spread it out on two large roasting pans that I sprayed with non-stick spray to make it easier. 4. I melted a bag of GF chocolate chips and drizzled it for just a little more decadence. If you do that, make sure you put in the fridge to harden a bit. 5. I dare you to make this and not eat it all night. I bagged it up right away and handed it out the next day. I made sure to leave enough for all of us to eat, but it’s so addicting…it’s hard to stop once you start. Trust me. I think this would make a great hostess gift or even something to bring to a potluck or party if you can’t decide. 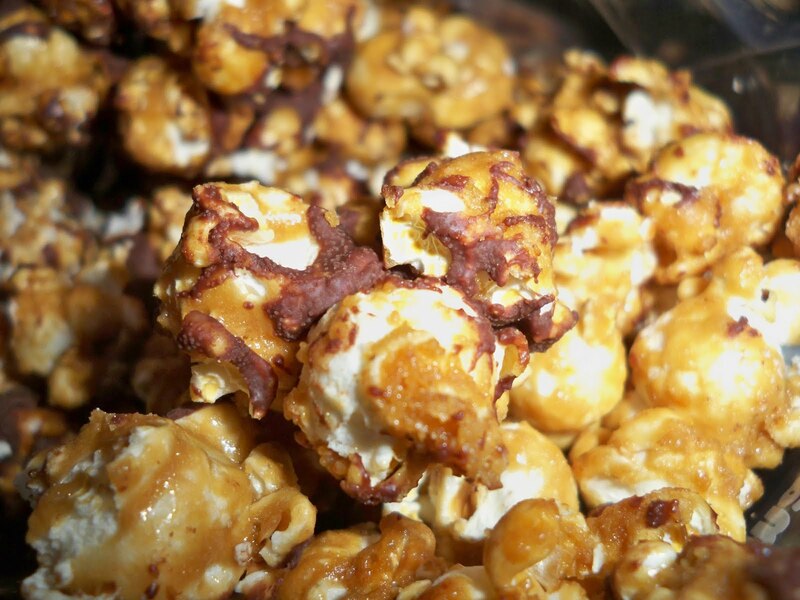 Best caramel corn ever…really.